Mastercraft Kitchens Tauranga is the one of the largest kitchen manufacturers in the Bay of Plenty, giving our valued client endless possibilities when choosing colours and materials. Established in 1986 by Murray Belz, this is where the Mastercraft brand was born. We now have 28 locations throughout New Zealand. Murray and his business partner Colin Campbell grew Mastercraft Kitchens Tauranga into a thriving enterprise. 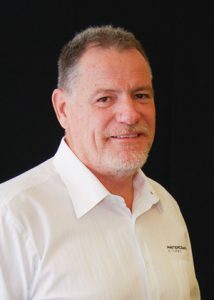 Colin is now the owner of Mastercraft Kitchens Tauranga. Visit us and wander through our extensive showroom to get all the inspiration you need for your dream kitchen. We work with you to ensure you are getting top quality. We work within your budget, and also offer the Mastercraft Kitchens 10 year Transferable Workmanship Guarantee on every kitchen we create. And any other kind of cabinetry you desire. Our design team use the latest CAD software and send your cabinetry specifications straight to our factory. Here we have state-of-the-art machinery to cut each component accurately. All of our kitchens are manufactured on-site. Our factory is equipped with the latest machinery, enabling us to deliver a fast, accurate and reliable product, every time. We also have a state-of-the-art spray paint facility in-house. We are the experts if you are after a quality lacquer finish on your kitchen cabinets. Pop in and visit us, or get in touch – take the first step to your dream kitchen at Mastercraft Kitchens Tauranga. Waihi, Athenrea, Katikati, Paeroa, Komata, Tirohia, Te Aroha, Katikati, Whiretoa, Waihou, Waitoa, Morrinsville, Matamata, Te Puna, Tauranga, Mt Maunganui, Te Puke, Papamoa, Maketu, Matata, Paengaroa, Pukehina, Rangiuru, Pyes Pa, Wairoa, Kairua, Whakamarama, Oropi and surrounding areas. Photo credit: The kitchens on this page have been created by Mastercraft Kitchens Tauranga. Thank you to our fabulous clients who invited us into their home to photograph their dream kitchens. Photography by Jamie Cobel. Showroom hours: Mon to Fri: 8am to 5pm. Weekends: by appointment Public Holidays: Closed.